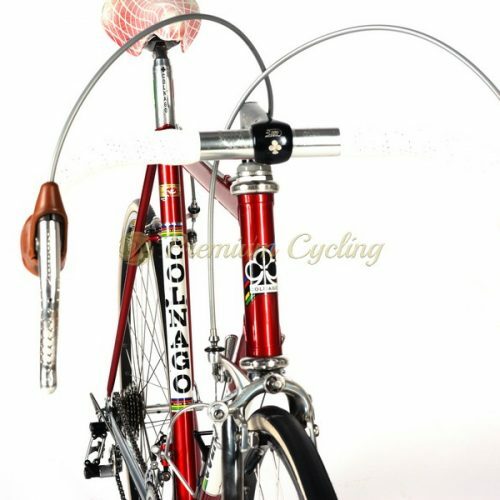 Mario Rossin worked as a frame builder at Colnago for several years. After a conflict with Ernesto Colnago, he and his 4 partners from amatuer team founded Cicli Rossin, on September 14, 1974. The “R” in the Rossin logo was adopted from Rossignol skis, and the pentagon represents the five founding members of the company. Mario Rossin was the design genius behind the company’s begining and ever since then the Rossin name has been one of innovation and racing success. 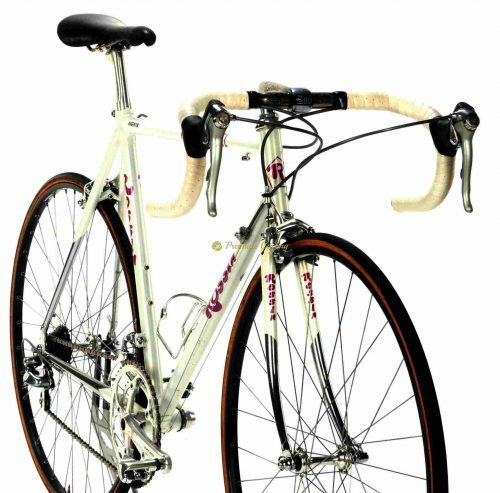 Rossin became high profile bike manufacturer through 1980s and 1990s with sposnsoring top level teams. Moreno Argentin was born near Venice on 17 Dec 1960, known as ”Il capo” (”The boss”). He started his pro carrer at Sammontana Team back in years 1981-1986, raced for Gewiss-Bianchi in 1987-1989, Ariostea 1990-1992, Mecair Ballan 1993 and finished with Gewiss Ballan in 1994. He won stages in the Tour de France, Giro d’Italia and Tour de Suisse. 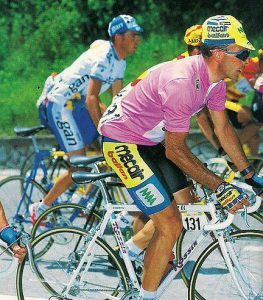 He became Italian national champion in 1983 and 1989, and world champion in 1986, won Liege-Bastogne-Liege 4x, the La Fleche Wallonne 3 times and the Tour of Flanders and Giro di Lombardia once. Happy to offer this oustanding piece of the cycling history – ROSSIN Performance EL ridden by ”The boss” Moreno Argentin back in 1993, when he rode for Mecair Ballan Team. 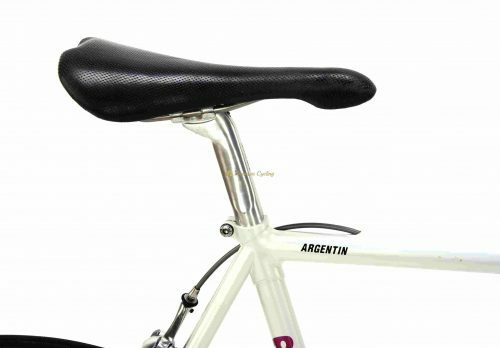 The frame is made of superb Columbus Extraleggeri EL tubing, featuring the perfection and attention to details to provide the best performance. The bike is in completely original conditon build with Shimano Dura Ace 7402-7410 groupset, 3ttt Rossin cockpit, Flite Titanium saddle, Ambrosio wheels. We got it from E.Bombini, the team manager of Mecair Ballan and Gewiss Ballan and he also wrote a statement this in one of Argentin’s bike from 1993. A real jewel for true collectors. Fair price. Condition: Used, but good condition. Some signs of normal use, some paintchips. Original paint. No dents, no cracks. Groupset and components are in good condition.